I’m saying my New Year’s resolution “out loud,” in hopes that will help me keep it. My goal for 2010 is to begin a project I’ve been thinking about ever since we moved to Northern California in 2005: I’m going to assemble as much material as I can find about the history of the Far West League, one of the numerous Class D baseball minor leagues that sprung up after World War II and went out of business in the early ’50s. But this is only part of the story. Perry also had 129 walks in 1948, 169 walks in 1949, 179 walks in 1950 and 180 walks in 1951 for on-base percentages well over .500. And he averaged 20 stolen bases a year. And he managed the Browns all four years. He also served as team president and league vice-president. James didn’t know this when he wrote about Perry, or didn’t mention it if he did, but an item in The Sporting News (above) said Perry was “awarded” the Redding franchise, and I’ve seen him referred to in various accounts as the team’s business manager and co-owner (not to mention bus driver, as seen in the 1948 TSN item below). I don’t know yet if Perry kept a financial interest in the franchise throughout its existence, or when he divested himself of it if that’s what he did, but I intend to find out. 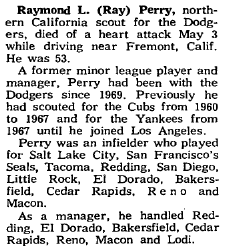 Perry met his wife when he was playing for the San Francisco Seals and she was head cashier at Seals Stadium. I don’t know (yet) if she was involved in the operation of the Redding franchise or not. In the Historical Abstract, Bill James wrote he didn’t know why Ray Perry drifted out of baseball, but the truth is he never did, as his 1973 obituary in The Sporting News shows (at left). His last full season as a manager was in 1960, but he was employed as a scout for the rest of his life. He did return to the dugout briefly in 1966, when he took the helm of the Lodi team in the California League for the last two months of the season. If you came to this page because you were doing a search for either the Far West League or Ray Perry…stay tuned. And if you have anything relevant you could share with me, I would appreciate hearing from you. I don’t think there’s much of anything readily available online about the league, beyond what you would find on Baseball-Reference.com, and James’ excerpt is the only online bio of Perry I’ve found. I’ve never even seen a picture of Perry as I begin this project. But now I’m preparing to plunge into newspaper archives and to try to track down former players or their surviving family members (I’m told Perry’s daughter is still alive), and I look forward to sharing whatever I find out. Details to come. This entry was posted in Baseball, Far West League on December 31, 2009 by prestonjg. Pingback: OK. Whew. That was hard. « THE ELEPHANT SEAL! I grew up in Klamath Falls. My mother raved about going to Gems games when she was in high school. This is the first place on the ‘net where I have ever seen any significant information about the Far West League. I am looking forward to future posts.